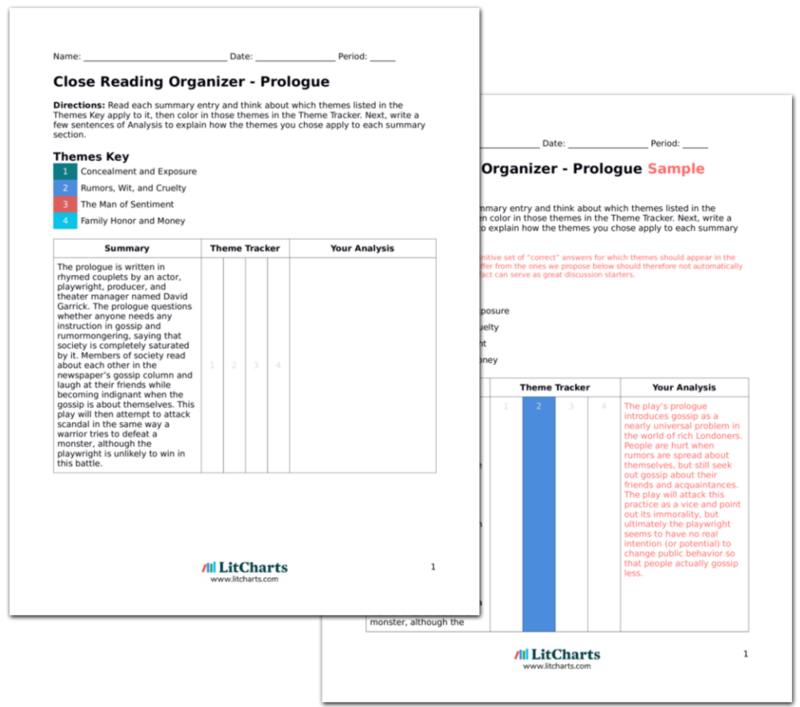 Instant downloads of all 946 LitChart PDFs (including The School for Scandal). The School for Scandal begins in the dressing room of Lady Sneerwell, a wealthy widow with a penchant for plotting and spreading rumors. Lady Sneerwell has hired Snake to forge letters for her and place false stories in the gossip columns. They discuss her plot to stop Charles Surface, whom she loves, from becoming engaged to the heiress Maria. Lady Sneerwell is conspiring with Charles’s older brother Joseph, who has a reputation for goodness, but is really a selfish hypocrite and liar, and who wants to marry Maria for her money. Snake departs and a group of gossipmongers, including Joseph, Mrs. Candour, Sir Benjamin Backbite, and Mr. Crabtree congregate at Lady Sneerwell’s house. Maria is also there, but she rushes from the room in distress when the others gossip about Charles’s enormous debts and financial misfortunes. The next scene introduces Sir Peter Teazle and his confidante Mr. Rowley. Sir Peter has lived all his life as a bachelor, but seven months ago married a much younger woman. He and Lady Teazle fight all the time and Sir Peter is sure his wife is always to blame. He complains of the bad influence that Lady Sneerwell has on his wife. He is also upset because Maria, who is his ward, does not want to marry Joseph. Sir Peter, who served for some time as a guardian to the Surface brothers, is convinced that Joseph is an exemplary young man with strong morals, and he believes that Charles is not only badly behaved, but also bad deep down. Rowley disagrees: he thinks Charles is wild, but will grow up into a good man. Rowley delivers the news that Sir Peter’s old friend Sir Oliver Surface has arrived back in England after sixteen years in the East Indies. The second act begins with a quarrel between the Teazles in their home. Lady Teazle wants large sums of money to buy luxury goods. Sir Peter reminds her that she grew up simply and lived with none of the things she now says she needs. Lady Teazle says she remembers that boring life well. After his wife leaves, Sir Peter marvels at how attractive she is when she argues with him. At Lady Sneerwell’s the gossipmongers (now including the Teazles) are laughing at their acquaintances’ appearances and misfortunes. Maria and Sir Peter find this gossip appalling, while Lady Teazle joins in with the others in making jokes at others’ expenses. Away from the others, Joseph tries to convince Maria to consider him as a potential husband, but she refuses. Although she says she knows from all she has heard that Charles is not fit to marry her, she will not consider marrying his brother. Lady Teazle, who has been considering taking Joseph as a lover, enters the room to find Joseph on his knees in front of Maria. He makes an excuse and, after Lady Teazle sends Maria from the room, begins to try to seduce Lady Teazle, but she is not sure whether to trust his explanation of what she saw. Rowley brings Sir Oliver to see Sir Peter’s house. They rejoice at being reunited, and Sir Peter gives Sir Oliver his impressions of the Joseph and Charles (who are his nephews and potential heirs). Sir Oliver thinks that the description of Joseph that Sir Peter gives is too good to be true. Rowley introduces Sir Oliver to Moses, a Jewish moneylender who will accompany him to see Charles, and the two men leave to call on Charles. Left alone, Sir Peter immediately gets into an argument with Maria, who says she will not obey his command to marry Joseph. Maria runs from the room and Lady Teazle enters. Sir Peter proposes that they should stop their quarrelling and his wife agrees, but when he tells her that she was always the one to start their fights in the past, they begin to fight again. Sir Peter accuses Lady Teazle of having an affair with Charles Surface, a rumor that Snake and Lady Sneerwell have been spreading. She indignantly denies this and leaves. Sir Peter is infuriated, especially because Lady Teazle never loses her temper when they fight. Sir Oliver, pretending to be Mr. Premium, arrives with Moses at Charles’s house, where Charles is drinking and playing cards with friends. Charles appeals to Mr. Premium for money, explaining that although he has sold off all his property, he expects to be the heir of the fabulously wealthy Sir Oliver. Charles suggests that Mr. Premium can collect the debt when Sir Oliver dies. Mr. Premium presses Charles for other collateral, and Charles suggests that he can sell him the family portraits. Inwardly, Sir Oliver is shocked at the disrespect this shows to family tradition, but he bids for the portraits in an auction. As the auction nears its end, Sir Oliver asks if Charles will sell him a specific portrait. Charles refuses, saying that it is the portrait of his generous benefactor Sir Oliver. Touched, Sir Oliver inwardly forgives Charles for being so extravagant. In the next scene, Lady Teazle arrives late for a date with Joseph at his house. She complains about her fights with Sir Peter, but is still unsure whether she wants to commit adultery with Joseph. Sir Peter arrives and, terrified of being discovered, Lady Teazle hides behind a screen in Joseph’s room as Sir Peter makes his way up the stairs. Sir Peter confides in Joseph that he is worried his wife is having an affair with Charles, but that he plans to soon give her financial independence from him, which he hopes will ease their fights. Sir Peter begins to talk to Joseph about his desire to marry Maria, but Joseph tries to stop him, not wanting Lady Teazle to learn that he is courting Maria too. At that moment, Charles arrives. Sir Peter says he will eavesdrop on the brothers to discover the truth about Charles and his wife. Sir Peter tries to hide behind the screen, but Joseph stops him, explaining that he already has a lover hiding there. Sir Peter hides in a closet instead. Charles enters and Joseph asks him about Lady Teazle. Charles denies any involvement with Lady Teazle and begins to say that he believed Joseph and Lady Teazle were the ones having the affair. Joseph stops Charles by telling him Sir Peter is listening. Sir Peter comes out and tells Charles he is very relieved. Joseph leaves the room for a moment and Sir Peter tells Charles that his brother has a woman hidden in the room. As Joseph returns to the room, the screen is pulled down to reveal Lady Teazle. Although Joseph tries to explain Lady Teazle’s presence there, Lady Teazle tells her husband the truth: she was considering having an affair with Joseph, who she now understands is a liar and hypocrite. She says that, even if she had not been discovered, she would have changed her treatment of Sir Peter after hearing how kindly he spoke about her. Soon after the Teazles leave, Joseph is visited by Sir Oliver, who pretends to be a poor relative named Mr. Stanley. Joseph speaks politely and eloquently about charity, but he tells Mr. Stanley that he has no money to give and that the rumors that his uncle sends him large sums of money are false. Under his breath, Sir Oliver says that Charles will be his heir. After Sir Oliver leaves, Rowley arrives to tell Joseph that his uncle has returned from the Indies and that he will bring him to Joseph’s house soon to see him. Joseph curses the bad timing of his uncle’s arrival. At Sir Peter’s house, the gossipmongers have gathered to try to find out what really happened between the Teazles. The servant refuses them entry so they stand in an anteroom arguing about what the real story is. Some believe that Sir Peter caught Lady Teazle with Charles, while others allege that it was Joseph. They also report that Sir Peter was wounded in a duel fought with the wife-stealing Surface brother, but there is no consensus about whether swords or pistols were used in the fight. Sir Peter then walks in unharmed and shouts for the ridiculous gossips to leave his house. Rowley and Sir Oliver arrive to tell Sir Peter to come to Joseph’s house for the meeting between the Surface brothers and Sir Oliver. Rowley pleads Lady Teazle’s case, saying that he spoke to her and she feels terrible for the pain and embarrassment she caused him. Upon Rowley’s urging, Sir Peter decides to reconcile with Lady Teazle. At Joseph’s house, Lady Sneerwell complains that Joseph ruined her chance to disrupt Charles and Maria’s engagement by getting caught pursuing Lady Teazle. Joseph tells Lady Sneerwell she may still have a chance with Charles because Snake has forged letters that suggest Charles has pledged to marry Lady Sneerwell, which should also ruin Charles’s chances with Maria. Sir Oliver and Charles arrive, and Lady Sneerwell hides in the next room. The brothers wish to make a good impression on Sir Oliver and try to force the man they believe to be Mr. Premium or Mr. Stanley from the room, fearing what he will say to their uncle about their behavior. Sir Peter, Lady Teazle, Rowley, and Maria arrive, and the Teazles reveal to the Surface brothers that the man they are throwing out of the house is their Uncle Oliver. Joseph tries to make excuses for his behavior, but Charles only apologizes for having disrespected the family by selling the portraits. Sir Oliver tells Charles he forgives him everything and Joseph that he sees through his hypocrisy. Lady Teazle suggests that Charles may also be interested in gaining Maria’s forgiveness, but Maria says that she knows he is already engaged to another. Charles is dumbfounded. Lady Sneerwell emerges from hiding to claim that Charles is engaged to her, but Rowley summons Snake, who reveals that he was paid to forge letters for Lady Sneerwell, but paid double to reveal the truth to Rowley. Lady Sneerwell storms from the room in frustration and Joseph follows. The play ends with an engagement between Maria and Charles, who will be his uncle’s sole heir. Levine, Yael. "The School for Scandal Plot Summary." LitCharts. LitCharts LLC, 19 Jun 2017. Web. 24 Apr 2019. Levine, Yael. "The School for Scandal Plot Summary." LitCharts LLC, June 19, 2017. 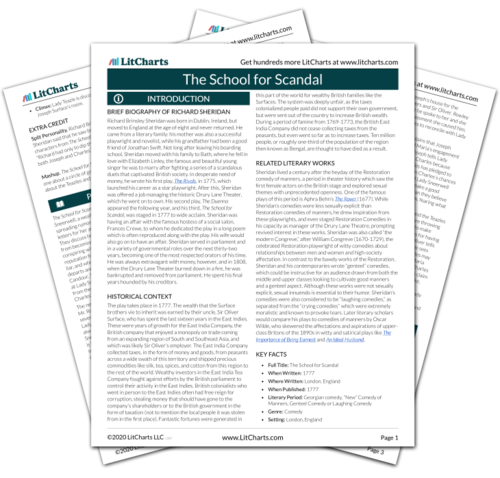 Retrieved April 24, 2019. https://www.litcharts.com/lit/the-school-for-scandal/summary.